Yesterday, Queen of England. Today, Mother of God. 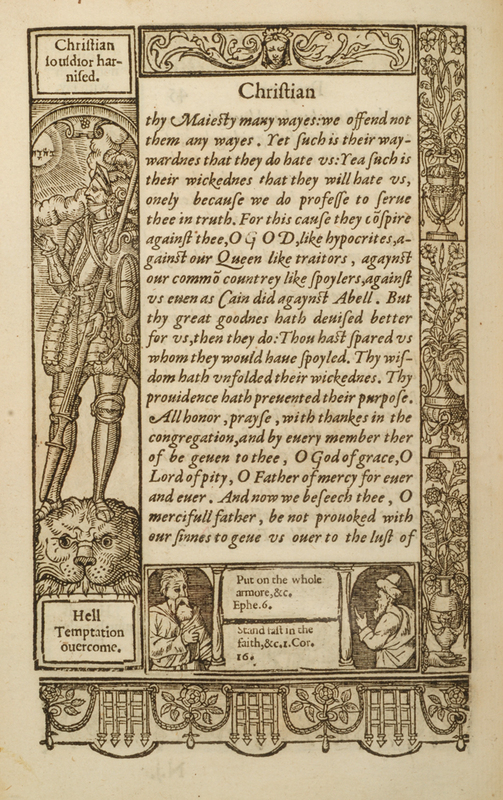 In 1578 an astonishing book was published in England, astonishing particularly if you were a Catholic. The volume, A Booke of Christian Prayers, contained a frontispiece portrait of Queen Elizabeth I, Britain’s reigning monarch, as the new Queen of Heaven, knocking Mary off the throne. Further, the book, gloriously decorated with elaborate historiated borders, had illustrations within those borders that might trouble Christians of the Roman stripe. Some border details are distinctly anti-Papist. The portrait had appeared in the first edition of 1569 yet this new edition was so different in content and appearance that the two editions (both commonly known as Queen Elizabeth’s Prayer Book) are considered to be separate works. 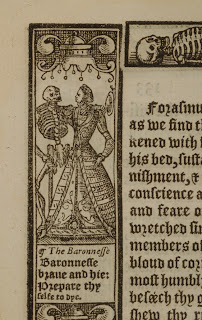 With its historiated borders, their content, as well as the portrait of Elizabeth I, the 1578 is a magnificent and dramatically iconoclastic volume. 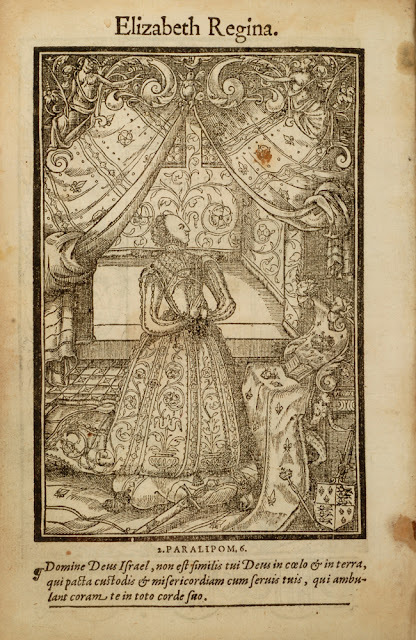 This famous woodcut portrait, possibly by lady-in-waiting and court painter Levina Teerlinc, on the verso of the title-page depicts Elizabeth at prayer. "In an outstanding example of iconoclasm, Elizabeth receives the place of honor in collections of prayers comparable to the Horae, in which the Blessed Virgin Mary once reigned supreme as Mother of God and Queen of Heaven" (King, Tudor Royal Iconography, p. 114). A prayer of Solomon which forms the epigraph suggests that the queen has supplanted the sage biblical king as wise governor who has re-established the Lord's Temple by imposing a Protestant settlement and bringing peace to Britannia. Down with the Church of Rome; up with the Church of England. 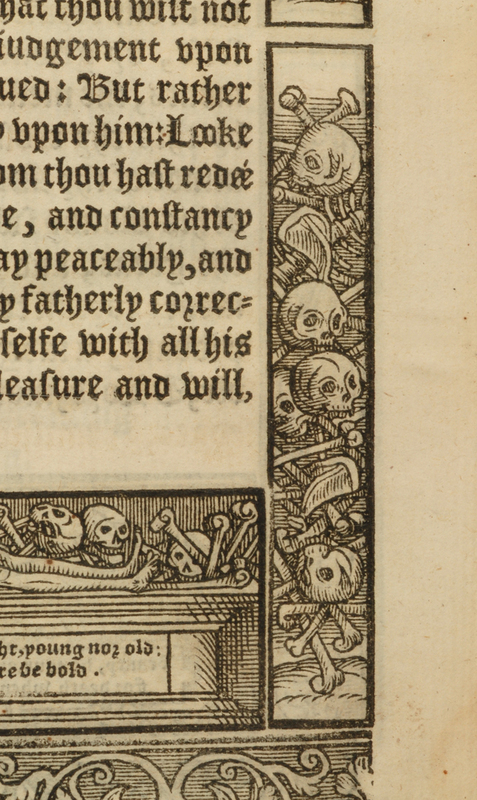 The striking woodcut borders, designed in the manner of Holbein and Dürer, give visual life to the prayers. 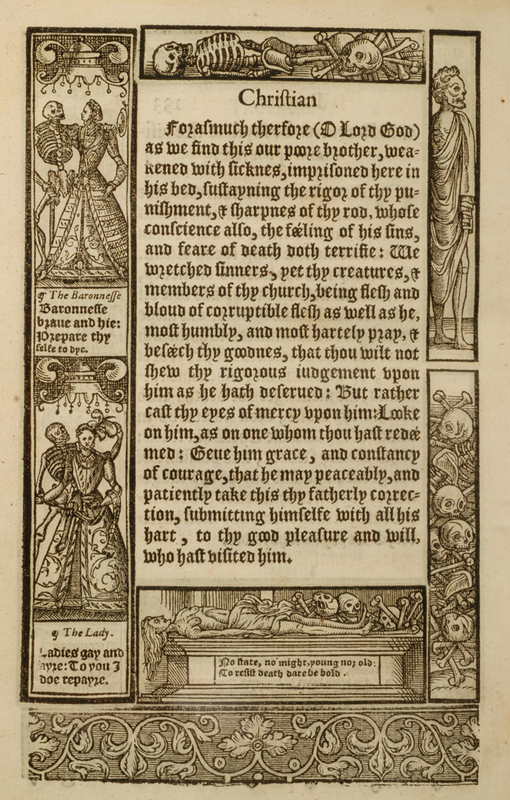 Arranged in seven successive sections, each follows a different theme in the canon of Elizabethan popular devotional iconography: the life of Christ; the personifications of Christian virtues and vices; the action of Christian virtues in daily life; personifications of the senses; the the Apocalypse; the Dance of Death, and, finally, various elements of Christian eschatology. The woodcuts are signed, and in three forms: the first series by an unidentified "C.I." 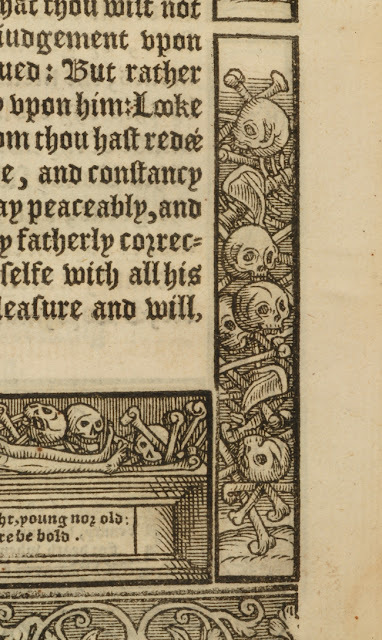 and the Dance of Death with a "G" except for the penultimate signed "CT." Artist "G" may be Marcus Gheeraerts the younger. What makes this book truly remarkable is its place within English printing history. At a time when the English printing industry was distinctly less sophisticated than that on the Continent, this is one of the few English books of the sixteenth century that can proudly take its place amongst the finest examples of contemporary European printing. As such, the book is a magnificent tribute to publisher John Daye's typographical skills. "Richard Day (b. 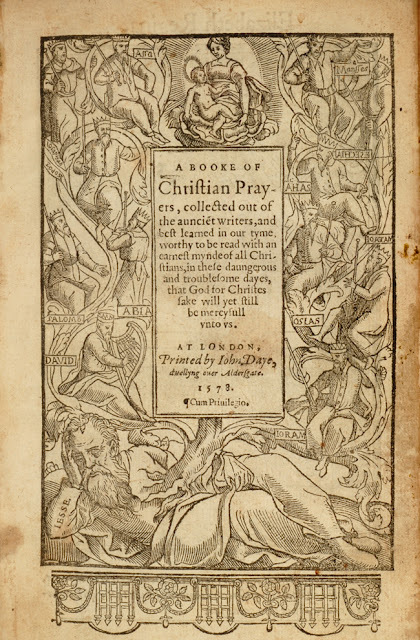 1552, d. in or before 1606), printer and Church of England clergyman, was born at Aldersgate, London, on 21 December 1552, the son of the printer John Day (1521/2–1584)... In 1576 Day assisted his father in the printing of, and wrote some of the prefixed verses to, the third edition of Foxe's Actes and Monuments. 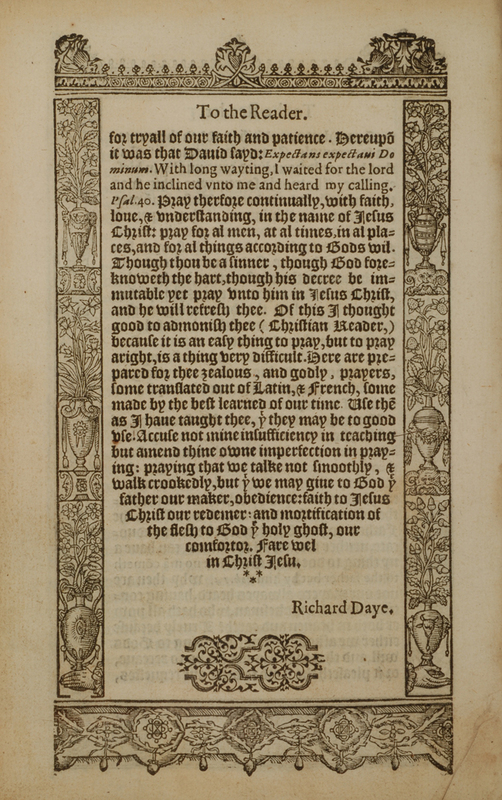 The following year, on 28 August 1577, he was named as co-patentee when his father secured the renewal of a lucrative patent for the printing of a number of works including the Psalms in metre and the ABC with Little Catechism, although it appears that Richard may have gained his half-share by misleading his father about the terms of the grant. 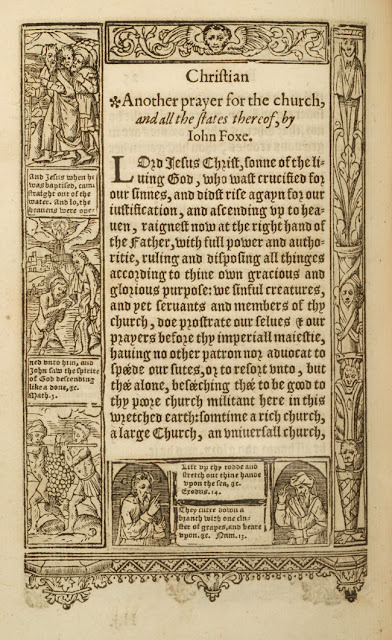 "Day entered his first book in the company's registers on 28 May 1578, his own translation of John Foxe's Christ Jesus Triumphant. 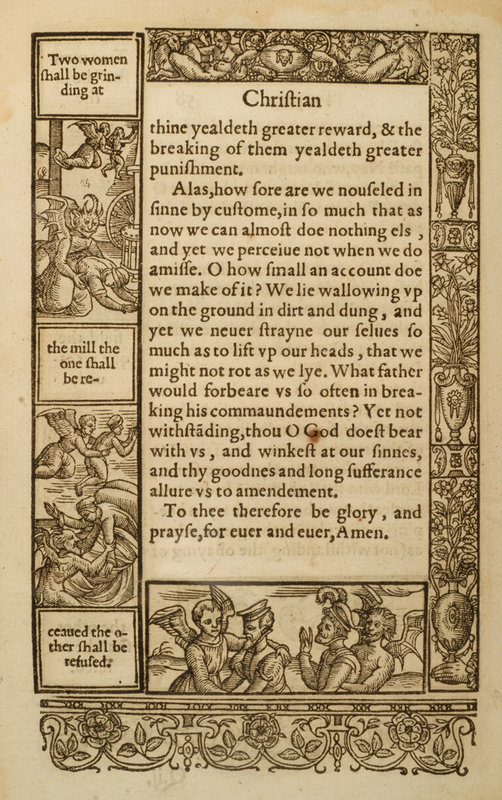 The work was followed by a newly prefaced edition of A Booke of Christian Prayers, Collected out of the Auncient Writers, otherwise known as Queen Elizabeth's Prayer Book. He also variously edited, translated, registered, and printed a handful of books over the next two years. However, his father evidently did not allow him to produce any works covered by the 1577 patent, as Richard took to pirating the little catechism and the metrical Psalms. As a result, in 1580 his father, then master of the Stationers' Company, assisted by the company's wardens, entered Richard's premises and took from him the bulk of his books, type, and press. No books were issued by Richard Day after this event. 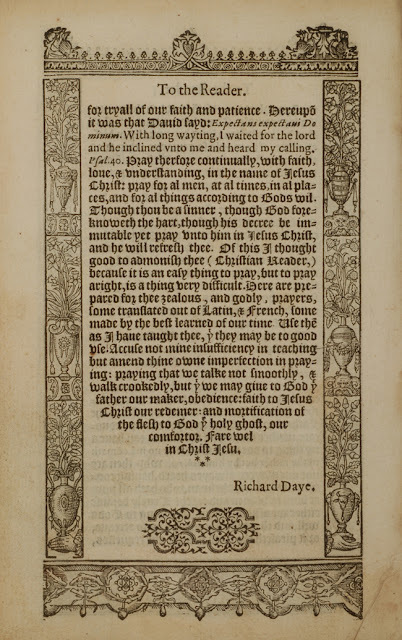 "Despite an attempt by his father in his final years to revoke Richard Day's rights to the 1577 patent, the patent continued in Richard's name until at least 1604 although all printing for it was done by five nominated assigns. Richard died some time before 13 April 1606..." (DNB). 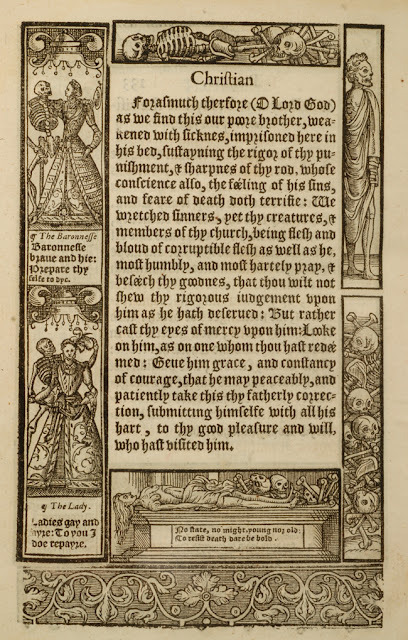 “As a repository of traditional iconographical material A Booke of Christian Prayers is unique among publications of the Elizabethan period” (Chew, The Iconography of “A Booke of Christian Prayers"(1578). Huntington Library Quarterly, Vol. 8, No. 3, p. 293). DAYE, Richard. A Booke of Christian Prayers collected out of the auncie[n]t writers, and best learned in our tyme, worthy to be read with an earnest mynde of all Christians, in these daungerous and troublesome dayes, that God for Christes sake will yet still be mercyfull unto us. 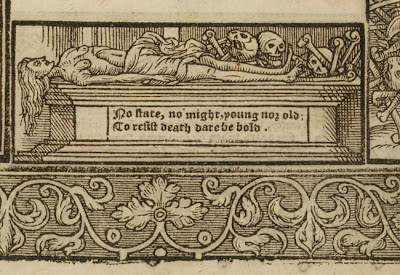 London: John Daye, 1578. First edition, the rare variant with Preface signed "Richard Daye," Octavo. , , , [3 as index. 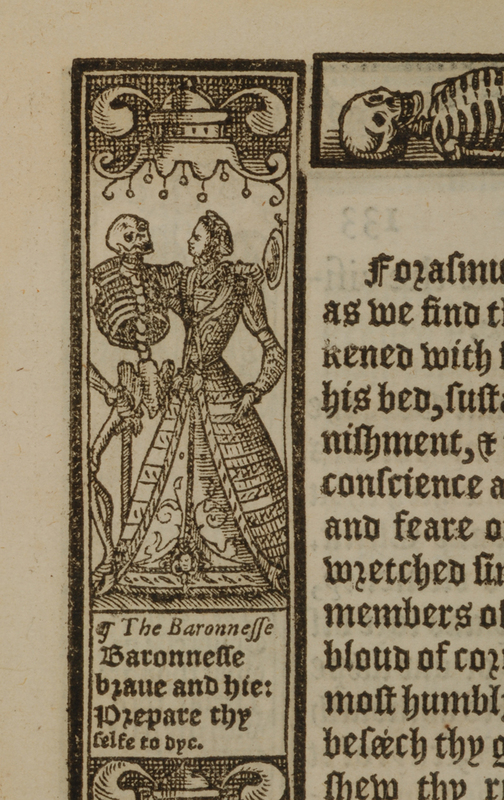 ], [1, colophon] pp., the pages numbered as 137 leaves. 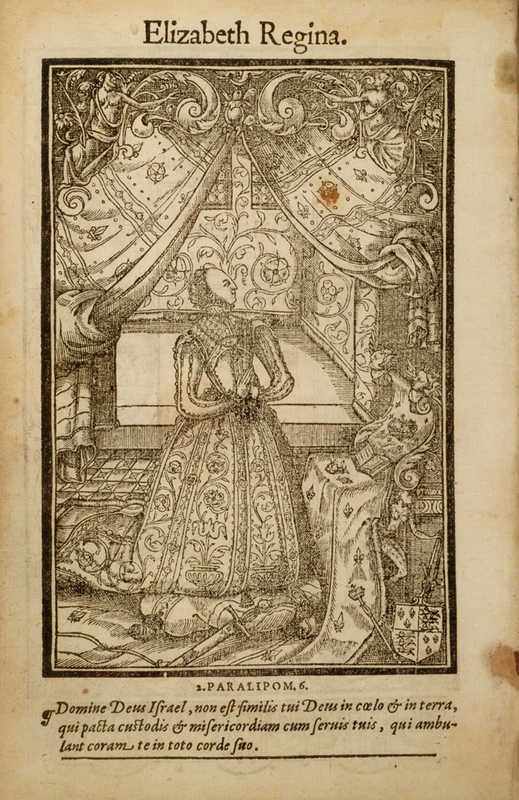 Woodcut engraved title page, woodcut frontispiece portrait of Elizabeth Regina at prayer. Magnificent, elaborately historiated woodcut borders designed after Holbein, Dürer, and contemporaries. Text in Roman and Black Letter. Images courtesy of David Brass Rare Books. Collectors may inquire here. A tip o' the hat to Peter Harrington. I've seen this before as well as Queen's Mary (I think) personal bible which is considered a work of art. I was recently at NYC's public library for a beautiful display of religious books - well worth the trip (and free). But the title-page has the Virgin and Child at top center--the first post-Reformation English image of the Virgin I've seen--so it seems odd to say that Elizabeth usurps the place of the Virgin in these volumes. . . . What do you make of the so-called "Apotheosis of Katherine Parr" in Bentley's 1582 Monument of Matrons? As far as usurpations of the BVM go, this one seems a good deal more suspicious--and the Queen looks a lot like Elizabeth (who is, of course, not dead). I would love to know more about John and Richard Daye if anyone could help? They are my 19th(?) grandparent. Is there a way to get a copy of any of their publications?